It’s been 10 weeks since we flipped the green switch and tried vegetarianism. This wasn’t a matter of health or ethics, more of a personal challenge after Caelan and I watched the documentary Vegucated on Netflix. I’m not naive in where my meat comes from. I grew up in the country and although my family weren’t farmers, I knew the lifecycle of the cows and sheep I saw in the fields around my parents home. I am a great animal lover but it never stopped me from enjoying meat, I could consciously separate the cute animals from the tasty end product. The documentary hit Caelan harder than me perhaps in some of the welfare issues presented (it’s an American documentary and as such they do not have the same regulations on intensive farming as we do) but the practices are still similar. 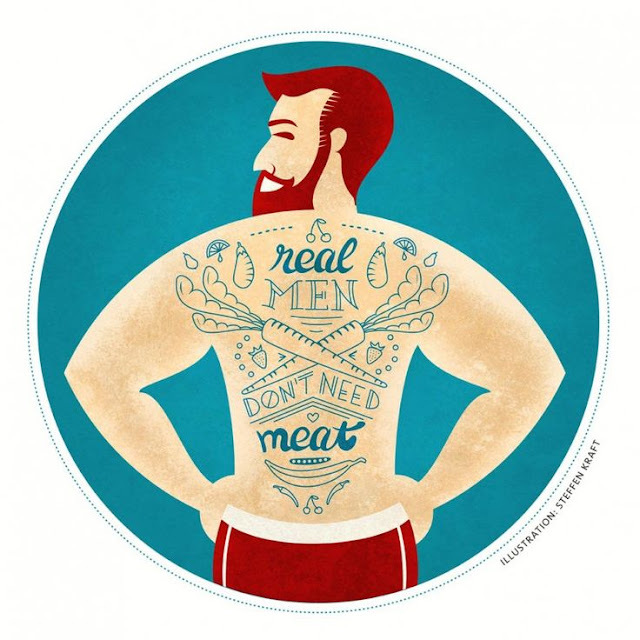 As such, Caelan made the conscious decision to remove meat from his diet. I followed suit both in solidarity and in curiosity. Over 30 years of eating meat would be a hard habit to break but I wanted to see if I could do it. A simple and tasty brunch we had in Father & Carpenter coffee shop Berlin which has become one of our favourite weekend treats. I initially planned to go full vegetarian however I have to admit defeat and made pescatarian concessions. Our occasional treat of a Chinese takeaway was a flop when we tried to order vegetable versions of our favourite meals so I switched to prawns for texture. Other than this and an absentminded accidental Haribo (I forgot about the gelatine) I’ve not had meat in my diet. Here’s the thing; I’ve not missed it. It's made me think more when it comes to planning and preparing my meals, not focusing on meat with sides but making full meals from ingredients I previously only considered as an afterthought. I have dabbled with Quorn (not a fan of the texture) and Linda McCartney substitutes but they are a lazy alternative and don’t compare to making something fresh from scratch. The only downside I’ve encountered is eating out. I hate mushrooms (the colour, smell, texture, taste - even sound; that squeak when you bite them makes me retch) and most restaurants' vegetarian option is just to chuck some mushrooms and cheese at something. However, I’m determined to not let little things like that put me off. I hope to remove all seafood from my diet in the future and switch to full vegetarianism. I've recently started back with Slimming World to help prevent my middle-age spread spreading. This means I'm cutting down on the likes of bread etc which does reduce my lunch options (especially if I've been too lazy to make it the night before) as Belfast is chockablock with sandwich shops and limited in other quick lunch ideas. However, it might just be the kick up the saggy arse I need to get more organised! I honestly don’t think I could commit to a vegan diet but that could just be the next challenge?